Targeting Millennials and post millennials with health and vitality brand. Encapsulating the fun-loving, health-driven identity of the Bam brand across every aspect of the business has been a exhilerating process. 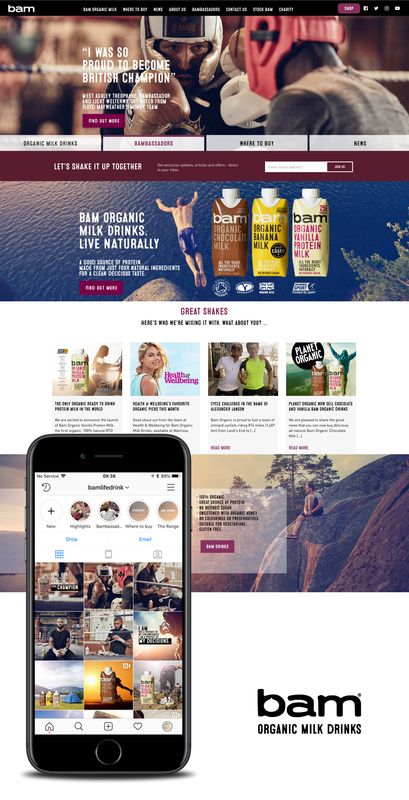 This includes brand strategy, campaign planning all digital and movies, point of sale, a brand toolkit and much more, helping launch Bam 100% natural organic milk drinks into a national and international market. Bam Organic is the first choice of the health conscious generation who know that what you put in is what you get out. We live in a world where artificial has been made easy… So, Bam fight the fake by creating deliciously simple drinks that are free from all the usual rubbish. The people at Bam Organic are passionate about finding a better way. You deserve and should have more choice – so they’ve removed the junk to make the healthy option easy. They’re dedicated to growing with you whilst promising to never be artificial and always keep it real.